Note: Use the dropdown list above charms to browse charm categories. To view all charms click on the “search charms” link and click the “search” button while leaving the text box blank. All resin charms are handcrafted and approximately ½ inches wide and 1 inch tall. Charms can be personalized for free. Hover mouse over product for description and price. This section displays the most popular charms given a selected header piece. Select a header piece to view charms in this section. Leave the textbox blank and click "search" to view all charms. Sign up for special e-mail offers. Your e-mail will not be given to any third parties. Did you know that our ornaments work great for year-round wall hangings? Our ornaments are not just for the Christmas tree but they also work great as wall hangings. 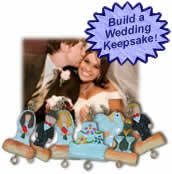 Capture the memory of your family, friends, loved ones, pets, vacations and build a unique personalized wall hanging keepsake. Drag and drop a header onto the "Add a header piece" image. Drag and drop charms onto the "Add a charm" images. Build an ornament in memory of your pets! Honor pets who have died and those who are living with a personalized ornament.